General's DAF800 Mini Digital Airflow Meter measures airflow in ducts, at grille returns and helps balance systems. 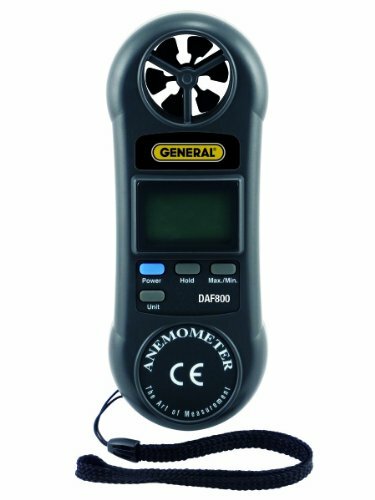 There are five available air velocity units - ft./min (fpm), m/sec, mph, mph and knots. The DAF800 is lightweight and features low-friction ball vane wheels to provide high accuracy at all air speeds. It has minimum and maximum recall plus data hold and auto power off. It is CE and RoHS approved. Includes wrist strap, user's manual and 1 Year Limited Warranty. Requires 1 9V battery (not included).